Attract a wide variety of birds! This cleverly-designed feeder lets you offer a wide variety of foods, so you can attract a wide variety of birds! It accommodates peanuts (loved by woodpeckers, chickadees, titmice, wrens, nuthatches), insects like mealworms or grubs (which attract warblers, bluebirds, woodpeckers, nuthatches, grosbeaks, mockingbirds, to name a few!) or fruits (loved by orioles, waxwings, tanagers, mockingbirds, plus many others). The bottom is metal mesh, which lets water drain out and permits air circulation to keep your treats fresh. 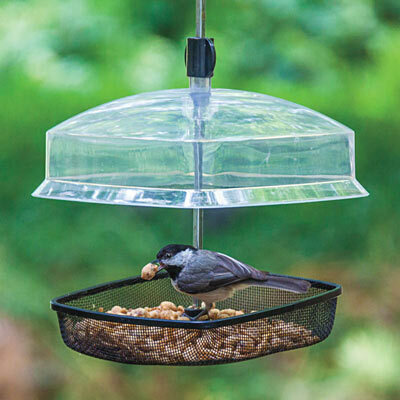 An adjustable dome of clear polycarbonate raises and lowers on its metal hanging rod to control the size of birds that can use the feeder. Being clear, it also gives you an unobstructed view of birds as they feed. Made of stainless steel, the swivel hook topping the hanging rod makes it easy to hang from a pole or branch. 12 1/2" high x 7 1/2" wide.